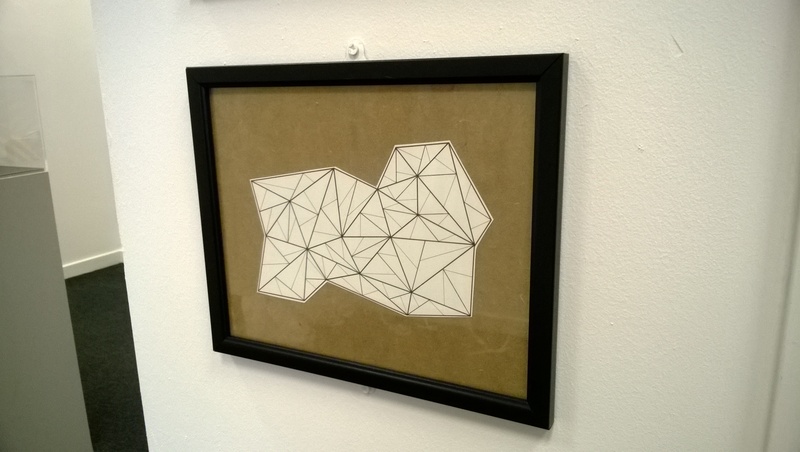 Here are four reviews of The UCB Art & Design Degree Show @ Rehab, The Arcade, Barnsley. Open from Mon 9th June. Free admission. 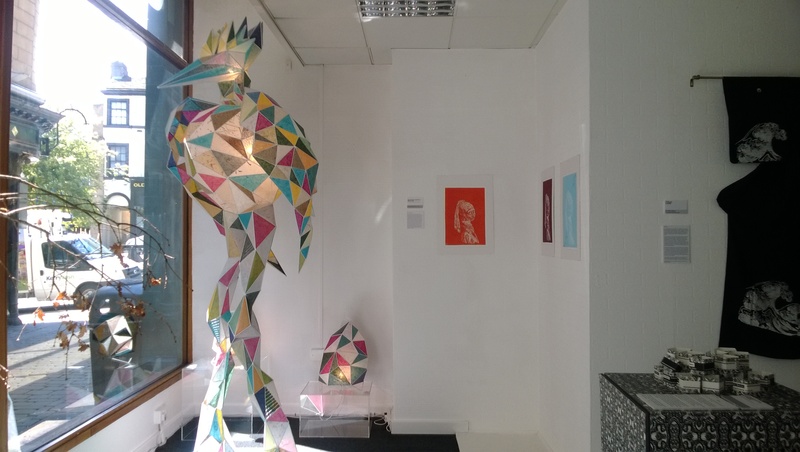 Held in a unit on the Barnsley Arcade, this is an exhibition that shows the work of the graduating degree students at UCB. There wasn’t a great number of exhibiting students and some of the work was quite hard to understand, but there were other pieces of work that were extremely interesting and inspiring to me. Charlotte Owen’s Ineffable was based upon the subject of mental illness, both internal and external causes. There was a Box Room that you entered and when you closed the door, it was dark and whispering voices filled the room. 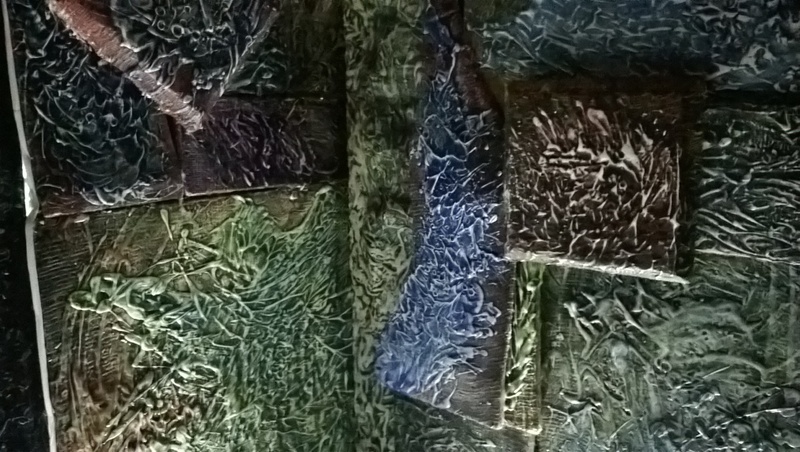 The walls on the inside of the box are covered in patterns that standout in the dark. This gives the effect that you are inside someone’s head. Lumi Lamps by Miryan Kostadinov is a very inspiring project. You can tell that a lot of work has gone in to the lamps, especially the large bird lamp. Each one is made out of triangular pieces of waxed paper that create a glass effect and are joined together by a metal frame. There were also items of jewellery made that were inspired by the Lumi Lamps. My favourite part of this exhibition is the work by Charlotte Owen as I found it extremely inspiring and interesting. This was only a small exhibition and other exhibits included a tree with knitted apples and an Alice in Wonderland project based around the communication of deaf people. 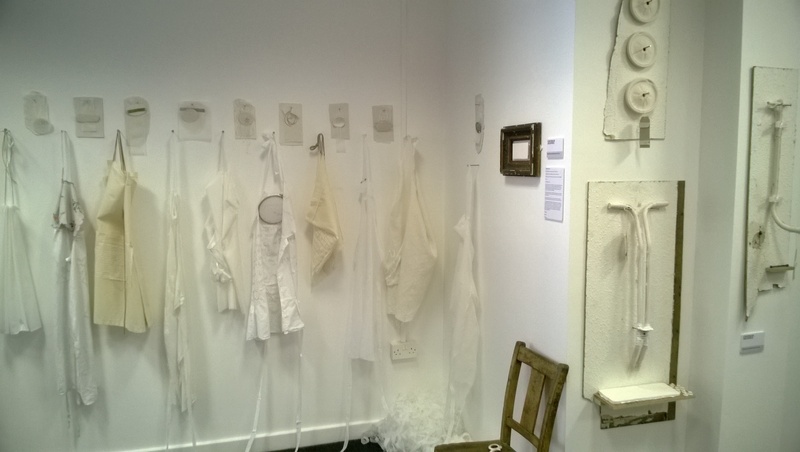 The exhibition is of the work of graduating artists from the Barnsley’s Art and Design degree course, which could include painting, sculpture, ceramics, illustration, printmaking and jewellery making. Students are encouraged to cross boundaries and experiment with materials and media in the pursuit of exciting and modern art and design results. Presenting their final year show at Rehab has allowed the students to develop their professional practice, whilst showing their work to the people of Barnsley. The work that most impressed me was by Miryan Kostadinov and Charlotte Owen. Miryan Kostadinov really stood out because I liked the colours, the lighting he produced and the way he puts together his geometric designs. I like the way he sticks with one shape – the triangle. Charlotte Owen also interested me because her work was inspired by mental illness. I like the way she uses black and white together to produce her pictures. I also found the box which gave you an idea of what it would be like to suffer from a mental illness, very interesting. There wasn’t a great number of students showing in Rehab. I found the display very unusual. Some of the pieces were hard to understand although I really liked the way they were presented. This is a beautiful place to sit inside and have a look around with family and friends. I loved this place, from the moment I went in. It was like the world stop moving and jazz music playing in the background. All in all this a great place to hang out and chat. 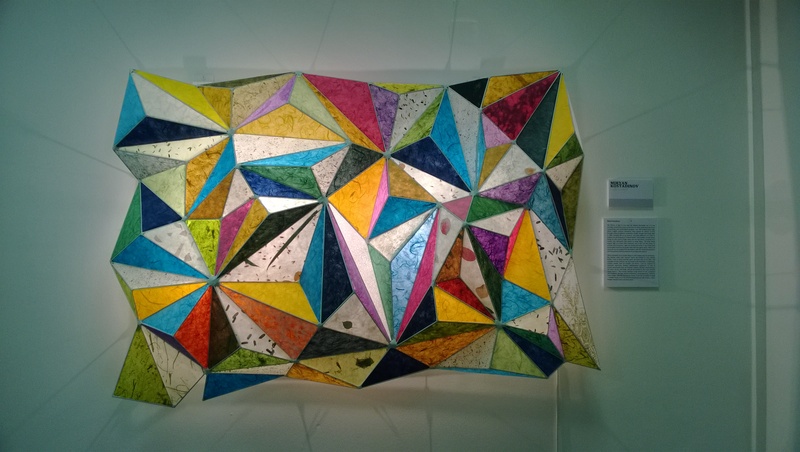 The experience of the degree show gives me an idea about what I can progress onto from my art and design course. The show includes lots of unique work by individual students showcasing the development to finished products. The part that really interested me was their inspiration, how they got started and how they translated an idea from their minds into reality. I was familiar with the techniques and mediums that some of the students have used as I have used it myself in my work. Some of these included using puff binding, screen printing, hand sewing, 3D design and more. The show really motivates me and inspires me to want to progress next year onto Fashion and Clothing Design. Overall, I would recommend the show to everyone especially if you are in your first year of college. Even if art is something you might not want to do in the future, it is still a good way to explore things that may not be in your comfort zone.